Joey Lawrence (more commonly disambiguated from the ’80’s TV heartthrob as Joey L) represents a new genre of photographer in the digital/internet age. Today, talent and persistence trump age and seniority. Also, Joey is a fellow Canadian, and I am a big fan of his work! He has done a lot of traveling over the last seven years on commercial assignments, like documenting different endangered cultures while bringing photojournalism to the fine art arena. His images are simply breathtaking. In his latest log installment, Joey shares bits and pieces of wisdom he learned along the way, many of which are so good that I took the liberty of not just linking, but including most of his post here. All text and images below are taken from Joey’s blog post here, and I strongly encourage you to check out his work, remaining posts, and – as christmas is coming up – get his DVD as stocking stuffer, or (as in my case): As gift to yourself! My first tip for traveling photographers is to protect your gear from theft. There are theives in every part of the world, not just developing countries. They know how much your pretty camera can fetch for on a black market, and they will risk a lot to steal your gear. When traveling, I make it a point to make my camera look crappy and old. I cover it with duct tape, carry it in a normal, dirty backpack, and make sure all recognizable logos such as “Canon” or “Phase One” are hidden. A nice looking camera case is also a red flag. I prefer typical “consumer” travel packs or using older weathered bags that have seen better days. When I travel with ugly photography equipment, attention is diverted away from my stuff. A potential theif may determine that stealing my camera is not worth the risk of being caught. After all, they can’t sell an old hunk of junk for the price of a “new camera.” Let the theif go after the next unlucky traveler. Other than theives, there are other people looking to give you a hard time for your nice looking camera- I’m talking about airport customs officers in foreign countries. In fact, I have a lot more problems with these often uninformed, egomanical workers than theives. 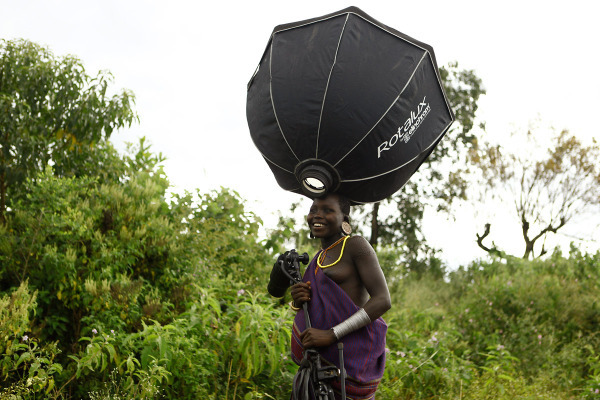 This is even more true for developing countries who are not used to living around this kind of expensive looking photography gear. I’ve been to many countries where the customs officer at the airport takes one look at my photography gear and gets very suspicious, even if I have a legal work permit for a shoot or letter from whom I’m working for. Is this guy working in the country illegally? Is this guy a spy or photojournalist with bad intentions? Is this guy going to sell the equipment here for profit? A trashy looking camera in a old dirty bag doesn’t look valuable, so it’s easier to get it by with less hastle. Disclaimer: When traveling for jobs, I always have the right working permits and carnets in order and I write “photographer” as my occupation on customs forms. I don’t mess around with this because it could jepardize the shoot and a large production. Getting a carnet (a temporary passport for your equpiment) is easier than you think, this website is a great resource. However, for personal trips creating my own photo series without a client other than myself, I don’t bother. I often won’t say I’m a photographer on my customs forms. Okay, I may be suggesting you break the law here, however, I don’t feel bad in doing so. In my experience, customs officers waste their time singling out professional photographers above many actual potential threats to their counties. They are often uninformed, and uneducated about what we do. Unfortunately, they lump every photographer into one category- “EVIL-DOER”. If you are respectful and educated about your subjects and doing good in the world with your work… great, follow my advice. If you are not, then my advice is not for you. Instead of “photographer”, I often write something more specific like “advertising retoucher” or “graphic artist.” That way, the conversations at customs can be more focused on what happens after the photographs are taken. If they do inspect your gear, then finding a bunch of cameras isn’t so surprising for them. The worst scenario would be for you to say you are a vegetable salesman, then the customs officer finds a bunch of cameras in your bags. What’s a vegetable salesman doing with all this stuff, huh? Hmm, suspicous… You need a story that can flow together with what you are traveling with, should your bags be inspected. When things are more fair for us photographers in immigration lines, I will tell the truth. Until then, I will bend the truth. When I travel for photography, I know that the most valuable things I have are not my cameras or equipment. The most valuable thing I carry are the images I am creating. 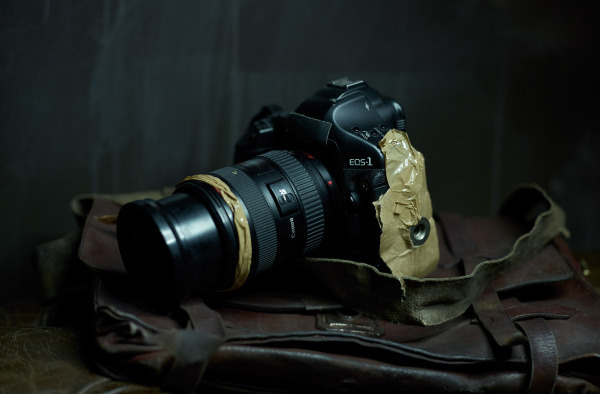 Gear can be replaced, (get it insured worldwide), but the photographs can not. I have a very simple formula. I travel with a laptop, and dump my images to two different hard drives. Each drive is an exact replica of the other. I then always keep those two hard drives in different places. For example, one is in my pocket at all times and the other is left at the Indian guesthouse. Or, perhaps one drive is in a piece of checked baggage being chucked in the bottom of the plane, and the other is safe with me in a carry-on bag. With this system, it is very hard for both drives to go missing. On more rugged trips or journeys into dangerous areas, I can take as many as 4 drives with me. That way, I can mail one home half way through the trip, and another at the end of the trip before I fly, while still carrying two hard drives home with me. Call me paranoid, but I do not take any risks about losing images. 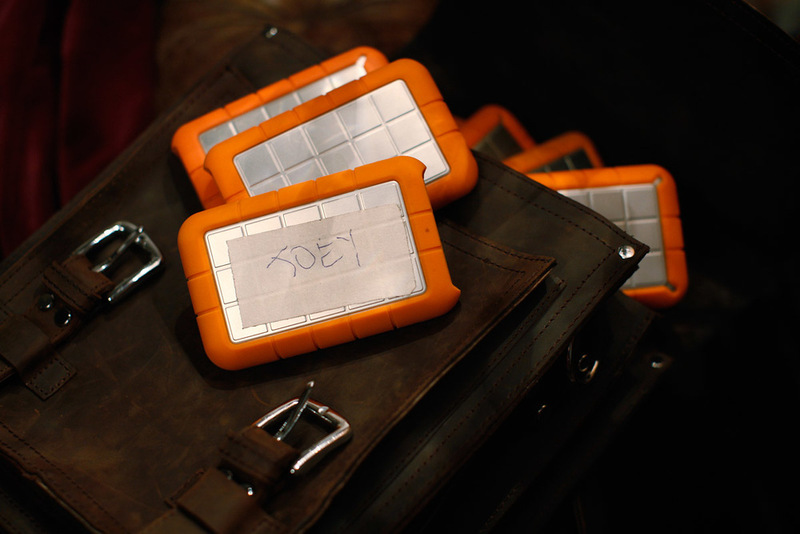 I strongly recommend the external Lacie Rugged Hard Disk, (pictured above). FTP or “drag and drop” online image storage systems like Dropbox are also great in some places, but often times there is no way I can upload the large amount of images I am creating. Many places I travel to often have slow internet connections, or no internet at all. If you have time to make image selections while on the road, you could always upload only your favorites to Dropbox, and take a risk on losing the rest. However, I still prefer carrying the physical drives containing every one of my photographs. For all the countries and places I’ve traveled to in the world, I could have actually gone to triple the amount of locations. But to me, that’s not as important as maintaining an in-depth relationship with the select places I choose to visit, and re-visit again and again. You can have more “authentic” cultural experiences as people warm to you and share their knowledge and lifestyle with you, and also create much better photographs when people trust you. Okay, so what if someone you didn’t know walked in your back yard, took photographs of you and your children, and then exchanged money for the interaction. Over time and countless repetition of this, you’d probably act the same way, right? If you don’t genuinely care about your subjects and respect them, it’s very difficult for them to care about you and your stupid camera. Do things that show you care. Stay in touch when you leave (exchange mailing addresses or e-mail), send copies of the photographs you created together back, and revisit the area if possible. 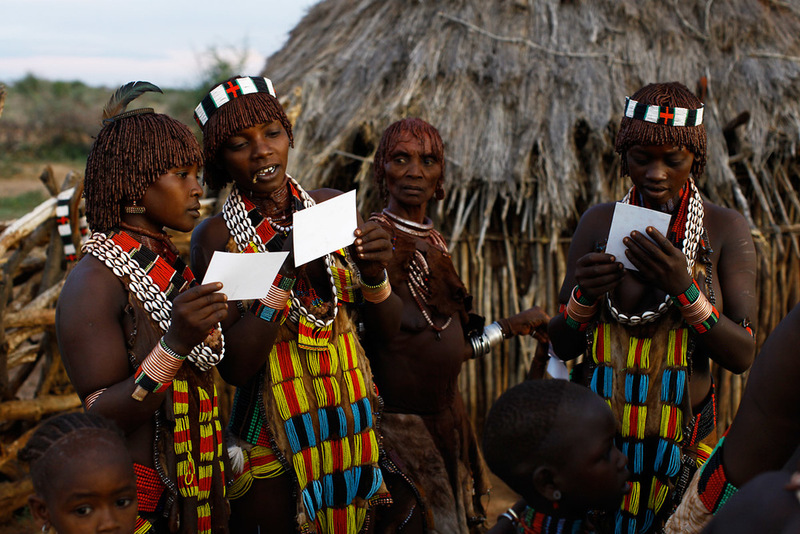 In the future, if/when the Hamer tribe of Ethiopia gets the internet and Google themselves, I want them to find my images. I want them to find photographs from someone who knew their names, who respected their culture, and told their story to the outside world as best as he could understand. I don’t want to be another looky-looker, like in the photo above. I can’t stress enough how important it is for photographer’s to hire locals when traveling. I realize that not everyone has months to spend when traveling getting to know people, so I always suggest involving the locals as much as you can in your work. Hire a local guide and fixer from the same area or culture as you are photographing. (I wrote an entire blog post about finding a local guide here, which falls under this principal.) If you require a crew or a little extra help, hire locals as workers and involve them in your productions. You might even want to hire the people you plan on photographing, so they can always be with you and understand your work. When your team is local, it is easier for the rest of the people you come across to develop a sense of trust and respect for your photography. Hyperjuice 100Wh Battery: Flights and long car rides are where I get a lot of my work done, but my Macbook Air battery only lasts a couple hours… Plugging your laptop into one of these external batteries can extend its life up to 26 hours. 220 Voltage Converter with Fuse: Most standard travel converters don’t have a fuse, and simply just re-route the power from a foreign plug. For those of us North Americans using electronics with 110V plugs, this can be dangerous. If you plug a North American electronic rated at 110V into a foreign outlet rated at 220/240V, there’s a good chance you’ll blow it up. This little box converts the power. Credit Card Sock: While this is extremely dorky, I find this is the perfect size to hide compact flash cards, money, or my passport.